The name “Archangel” is given only to Saint Michael, even though sacred tradition and the liturgy of the Church attribute the same title to Saint Gabriel and Saint Raphael: “When Michael, the archangel, disputing with the devil, contended about the body of Moses, he durst not bring against him the judgment of railing speech, but said: The Lord command thee.” In spite of such an explicit testimony of the Scripture, a few writers have maintained that Saint Michael, because of his exalted position among the Angels, must belong to a much higher order, perhaps to that of the Seraphim, rather than to the order of Archangels. We do not believe that this opinion can be defended. The exalted position occupied by Saint Michael can be explained by the fact that, even though he belongs to a relatively low order by nature, his outstanding zeal for the glory of God and the salvation of his fellow Angels, at the time of Satan’s rebellion, merited him such glory and power as to equal and even to excel through grace such celestial spirits that belong to a much higher Choir by nature. If we remember, ie Angels lived through a period of probation during which they could merit each according to his works. The great variety of merit explains, in addition to other natural elements, the great difference in their glory and in their power. Saint Michael has always been the warrior Angel, fighting first Satan and his demons from the beginning, then, in the course of time, all the enemies of God’s own People. He is “the great prince, who standeth for the children of thy people.” As of old, so today, Saint Michael is the great defender of the Church of Christ on earth. The now famous problem, “The Angel of the Lord,” <Malakh Yahweh>, that has engaged the attention of Scripture scholars for decades, may perhaps be solved by admitting that this mysterious Angel of the Lord (who in various books of the Old Testament is represented as acting in ie name of God Himself, and is often received and honored as God would), is none other than the Archangel Saint Michael, God’s own legate to His people. The words of the prophet Daniel seem to insinuate this: “None is my helper in all these things, but Michael your prince.” “At that time shall Michael rise up, the great prince, who standeth for the children of thy people.” A legate can speak and act in the name and by the authority of the supreme ruler who sent him and whom he represents. This seems to have been Saint Michael’s position with the children of Israel; he was both the heavenly Prince representing the King of Heaven and the heavenly protector of God’s own people against both human and diabolical enemies. Saint Michael who had defended and protected God’s children in the spirit world, was to extend the same protection to the human children of God here on earth. Surrounded and threatened as they were by hostile pagan nations, over which Satan had established his tyrannical rule, Saint Michael could not remain indifferent to this new form of seduction and rebellion introduced by his archenemy among the children of men. As long as Satan persists in his attacks, the heavenly champion, the Prince of the heavenly hosts will continue to shatter his plans with the war cry of old: “Who is as God?” In the Old Testament, therefore, Saint Michael is the Angel par excellence, the Angel of the Lord, the national Guardian Angel of the Israelites. At times, especially in the book of Exodus, this “Angel of the Lord” is called simply, the Lord; as for example in this passage, “And the Lord went before them to show the way by day in a pillar of a cloud, and by night in a pillar of fire, that he might be the guide of their journey at both times.” He who is called “the Lord” in this passage, is mentioned again in the same capacity as the “Angel of God” in the following passage: “And the Angel of God, who went before the camp of Israel, leaving the forepart, stood behind, between the Egyptian camp and the camp of Israel, and it was a dark cloud, and enlightening the night.” This very clever military maneuver dearly shows the strategy of the Prince of heavenly hosts. The other opinion which holds that the expression the “Angel of the Lord” is not really an Angel, or Saint Michael, but the Word of God (the Logos) God Himself, is now regarded as a mere conjecture and a rather obsolete opinion. Several apparitions of the Archangel Michael have been reported during the Christian centuries. One of the most outstanding of all such apparitions is the one which is commemorated in the universal Church on May 8. The Archangel Saint Michael appeared on Mount Gargano in Apulia, South Italy, in the days of Pope Gelasius (492- 496). A shrine was erected in the cave of the apparition and it became the goal of devout pilgrimages in subsequent centuries. Another feast in honor of Saint Michael the Archangel, on September 29, formerly known as <Michaelmas>, is the anniversary of the Dedication of the former basilica of Saint Michael and all the Angels on the Salarian Way in Rome. An apparition, similar to that of Mount Gargano, was honored in the great shrine called <Michaelion>, near Constantinople, according to the historian Sozomenus, who wrote about the middle of the fifth century, a century of great devotion to the Holy Angels in general and to Saint Michael in particular. Saint Michael is invoked in a particular manner in the prayers recited at the foot of the altar after Mass: “Saint Michael the Archangel, defend us in battle, etc.” This particular prayer is a condensed form of the general exorcism against Satan and all the evil spirits, published by Pope Leo XIII. As long as God’s children are exposed to the attacks of Satan in this world, Saint Michael’s battle cry: “Who is like God?” will continue to scare and shatter all the forces of evil, and his powerful intervention in the struggle in behalf of the children of God will never cease. God our Father, in a wonderful way you guide the work of angels and men. May those who serve you constantly in heaven keep our lives safe from all harm on earth. 6th September 2009 – Pope Benedict XVI at Viterbo, Italy: Newman, ‘celebrated intellectual and man of luminous spirituality’ Pope Benedict XVI described the Venerable John Henry Newman as a “celebrated intellectual” and a “man of luminous spirituality”, in a homily during his recent pastoral visit to Viterbo. Around 20th September Paul of the Cross started for Rome along the Aurelia Highway, and after almost two days of intense walking, entered the city by Porta Cavallegeri beside St. Peter’s Basilica. He found lodgings in the Holy Trinity Hospice near Ponte Sisto. The following day, possibly 25th or 26th September, he went to the Quirinal, then to the papal palace where he asked to speak to the master of the sacred palace, and, we presume, to present his bishop’s letters of recommendation of which none has come down to us. He was summarily sent away. Paul felt terribly desolate, with perhaps a passing doubt as to the validity of the efforts made. However he quickly recovered his calm and courage by contemplating the human failure of the Cross of Christ. 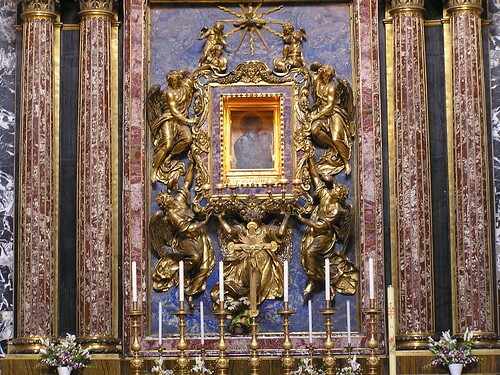 Then, almost as an act of reaffirming his fidelity to what God has given him to understand by so many inspirations he went to St. Mary Major’s where before Our Lady he “vowed to promote devotion to the Passion in the hearts of the faithful and, to this end, to endeavour to gather companions”. Coming from the direction of the papal palace, Paul would have entered the Basilica from the door at the back of the building, between the main altar and the Chapel of the Madonna, known as the Borghese Chapel. The cool stillness of the chapel had a soothing effect on him, as did the painting above the altar: the icon of Mary known as Salus Populi Romani, said to have been painted by St. Luke. Kneeling there, allowing the turmoil to leave his heart, he prayed for understanding. Slowly he realised that it was not yet time for presenting the Rule to the pope; that day would come. In the meantime, he must be faithful to the inspiration God had given him. When all doors seemed closed, the only way forward was to commit himself more fully to the work he had been given to do. Before the icon of Mary, he made a vow to promote the memory of the Passion of Jesus and to work to gather companions for this purpose. Who was St. Paul of the Cross?